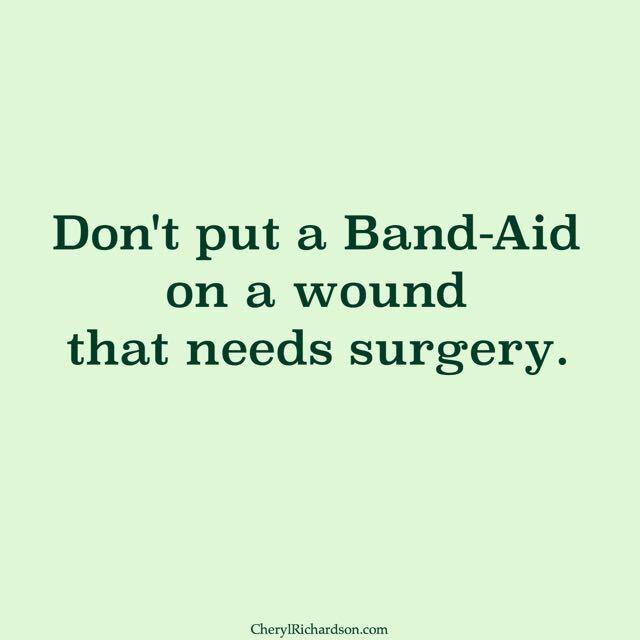 Week 22 – Don’t put a Band-Aid on a wound that needs surgery. Nearly two years ago, Michael and I went to a beautiful, seaside wedding off the coast of Maine. Our friends had chosen the most spectacular setting on a bay overlooking islands, ferry boats, and late night fireworks. During the ceremony, as Michael and I listened to the vows the bride and groom had written for each other, I was transported back in time to our own outdoor wedding seventeen years earlier. I smiled to myself as I recalled the memory of that day. The innocence of early love. And you quickly discover that this magical mystery ride called “relationship” is filled with experiences you never in a million years could have planned for. And that’s when the real commitment starts, ushering in the process of falling in love. But only if you’re willing to do the work. When the truth of what it means to build a life together unfolds, you soon realize that the best of intentions pales in comparison to what’s required for a partnership to flourish. Nothing has forced me to grow more than my marriage to Michael. And nothing has brought me more aliveness, meaning, and joy. Staring at the silhouette of our friends against the summer blue sky, I thought about the vows I’d write today given the history, experience, and maturity gained from more than twenty years of being together. First and foremost, I’d vow to do my best to remember that marriage is a spiritual partnership designed to teach us about love – how to love each other and ourselves – so we can share that love with the world. I’d promise to keep the higher vision of this partnership in mind, especially when things get hard. During tough times, I’d vow to come to the table, heart in hand, ego checked at the door, ready to listen and learn, knowing that the greater good of our marriage is far more important than getting my way. I’d promise to create a habit of remembering five things I love about Michaelbefore entering into scary and hard conversations that are sure to push our buttons. I’d commit to always look for the role I play in any mess we happen to find ourselves in, and be willing to do what it takes to heal so I can become a more loving and respectful partner. This healing work is rarely, if ever, done alone so I’d also commit to getting whatever help we need the moment we start wounding each other. I’d vow to look for things, big and small, to appreciate about Michael every day – and to share this information with him because I now know that people grow with love and appreciation, not criticism and nastiness. I’d commit to learning how to be big enough to admit when I’m wrong and to apologize even when I think I’m right. I’d pledge to cultivate the necessary patience needed to travel the winding path of partnership so we’re not tempted to put Band-Aids on wounds that need surgery. Finally, I’d vow to revisit these promises every year on our anniversary, in order to update them. The evolution of any relationship requires regular upgrades to Love’s operating system . A reader in Canberra, Australia sent this week’s video to me and it contains a beautiful message. Thanks, Netty! You can watch it here.